There have been a lot of really great films released in 2017. I have been fortunate enough to see 63 of them so far, and I plan on seeing more before the year is up. However, as of today, these are my top ten films released in 2017. As an aside, the following films are not included because I have not seen them yet: Dunkirk, Lady Bird, Mother!, The Florida Project, The Disaster Artist, Coco, Call Me By Your Name, Good Time, and Logan Lucky (among others). All scores are pulled from Metacritic.com. "An estranged family gathers together in New York for an event celebrating the artistic work of their father." The Meyerowitz Stories (New and Selected) was a complete surprise to me. Netflix originals have a sort of stigma due to their wide range in quality -- from very good to very bad. However, this effort from Noah Baumbach manages to be a heartfelt exploration of a dysfunctional family. It's also very funny. Most surprising of all, though, is how incredible Adam Sandler is in it. In fact, I'd go so far as to say it's one of the best performance he's ever given. Equal parts heartbreaking and hilarious, The Meyerowitz Stories is a Netflix Original that showcases the kind of indie film possible when partnered with a capable writer/director and Netflix's resources. "After returning to the criminal underworld to repay a debt, John Wick discovers that a large bounty has been put on his life." The John Wick films are some of the best action films ever released. Part of this is due to Keanu Reeves's fiery performance; much of it is due to the taut writing, and the solid direction. The fight scenes are gorgeously executed and brilliantly edited (in an age where every action scene seems to get cut to pieces in the editing process, it's nice to see the John Wick films embrace skillful choreography and wide shots over close-ups and rapid editing), and the world is rich with textured characters and mythos. John Wick: Chapter 2 raised the bar in this trilogy (Chapter 3 is currently set to hit theaters in May of 2019) by both expanding the mythos of the hitman underworld that was introduced in the first film and greatly increasing the stakes of the film. In every way, John Wick: Chapter 2 works as a sequel and as a stand-alone film. It was definitely one of the most entertaining films released in 2017. "Steven, a charismatic surgeon, is forced to make an unthinkable sacrifice after his life starts to fall apart, when the behavior of a teenage boy he has taken under his wing turns sinister." The Killing of a Sacred Deer is perhaps the most original, and odd, film of 2017. Written and directed by Yorgos Lanthimos (who also directed 2015's The Lobster), this is a film that consistently keeps you unnerved. Utilizing odd dialogue, a potent combination of wide tracking shots and tight close-ups, and long moments of silence this film manages to keep you uncomfortable throughout the entire runtime. Based loosely on the tragic Greek play Iphigenia in Aulis by Euripides, this film manages to deftly balance extremely dark comedy with extremely dark drama. Its climax is tense and uncomfortable. It took me a few minutes to fully process what I had seen once the credits started to roll. "In the near future, a weary Logan cares for an ailing Professor X, somewhere on the Mexican border. However, Logan's attempts to hide from the world, and his legacy, are upended when a young mutant arrives, pursued by dark forces." Few superhero films have earned the distinction of transcending their genre wrapping -- in fact, The Dark Knight is really the only film to be judged truly as a 'film' and not just as a comic book movie. However, Logan came damn near close to reaching that upper echelon; in doing so, it became one of my favorite films of 2017 and one of my favorite superhero/comic book films ever. Part of it is due to the finality of the film -- this was Hugh Jackman's last performance as Logan. You can see the passion in his performance and the raw energy in every frame of the film. It's this dedication to the character and the performances (including a heartbreaking final performance as Professor X from Patrick Stewart) that make this film as good as it is. It does stumble in a few places along the way (the film is more overzealous with the F-bomb than it needed to be), but it really soars in the places it succeeds. Starring: Joel Edgerton, Christopher Abbot, Carmen Ejogo, Riley Keough, and Kelvin Harrison, Jr.
"Secure within a desolate home as an unnatural threat terrorizes the world, a man has established a tenuous domestic order with his wife and son. Then a desperate young family arrives seeking refuge." It Comes At Night toys with you throughout its run time. I'll tell you this up front (it's not a spoiler) we don't find out what comes at night. It's not important to this story. The title is more allegorical than literal. If you can get past this, then you will find a film full of tension, horror, and suspense. The core cast is incredible and the threat in the film is palpable. The final act of this film will leave you breathless, sad, angry, and confused all at once. That is the mark of a great film and a confident director. "Two men return home from World War II to work on a farm in rural Mississippi, where they struggle to deal with racism and adjusting to life after the war." 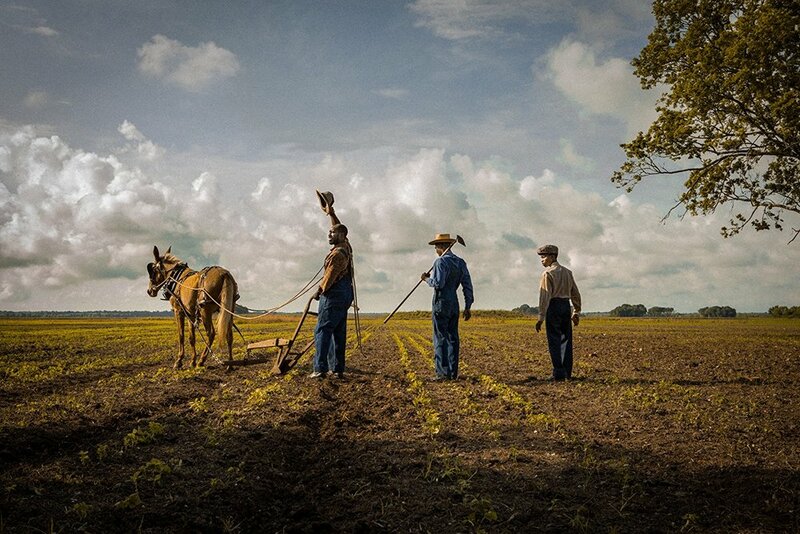 Mudbound is a sobering film in every respect. Another Netflix Original, this one (helmed by Dee Rees, who also directed 2015's Bessie) explores racism and classism in Mississipi during, and after, World War II. The cast is incredible at every turn, and the cinematography is gorgeous. The writing slips into melodrama at times, but that only complements the themes at play in this film. Mudbound was a complete surprise, but that doesn't change the fact that it is one of my favorite films of the past few years. "After being coerced into working for a crime boss, a young getaway driver finds himself taking part in a heist doomed to fail." Photo by Wilson Webb - © 2017 TriStar Pictures, Inc. and MRC II Distribution Company L.P.
Edgar Wright exploded back onto the silver screen with the sleek, visually stylish Baby Driver. Part heist film, part music-driven driver film this is a wholly engrossing, entertaining, and surprisingly funny film that encapsulates everything we love about Edgar Wright's films. The visuals in this film are incredible, with the car chase scenes standing out in particular. The usage of music (and the music used) is perfectly integrated into the narrative. Ansel Elgort is great, as is his supporting cast. This was one of the most fun theater experiences I have ever had, and that is saying something. "A mother personally challenges the local authorities to solve her daughter's murder when they fail to catch the culprit." Speaking of directors returning to the silver screen in style, Martin McDonagh brought us this film -- his first directorial effort since 2012's Seven Psychopaths. Featuring his trademark dialogue, his incredibly dark humor, and his excellent narrative structure Three Billboards Outside Ebbing, Missouri is a hilariously dark dramedy with a lot of heart. What is most surprising, though, is Sam Rockwell's character. Without spoiling anything in the film, his character goes on a surprisingly interesting and powerful arc that complements Frances McDormand's character arc as well. 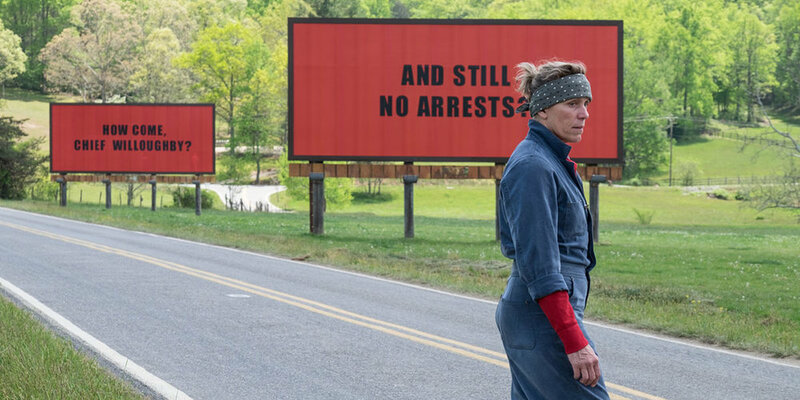 While I don't expect Three Billboards to get much love during awards season, I do think it is worthy of the critical and social praise it has received thus far. "In this singular exploration of legacy, love, loss, and the enormity of existence, a recently deceased, white-sheeted ghost returns to his suburban home to try to reconnect with his bereft wife." I will say this upfront -- A Ghost Story is not for everyone. It is a very slow, methodical, meditative exploration of time and space. However, for those who are patient enough to watch the entire thing, you will be blown away by its scope and ambition. This is also a very intimate story. Following the ghost of C and his widow, M, we get to see how heartbreaking it is for life to move on after you have died. Despite the fact that our main character is covered by a white sheet for the majority of the film, this is an incredibly emotional concept, and it makes for an incredibly emotional film. It's also quite impressive the kind of philosophical elements this film is able to explore in a 90-minute runtime. "A young blade runner's discovery of a long-buried secret leads him to track down former blade runner Rick Deckard, who's been missing for thirty years." Photo by Courtesy of Warner Bros. Picture - © 2017 Warner Bros. Entertainment Inc. All Rights Reserved. It saddens me (though I don't find it surprising) how poorly this did at the box office. However, this was just as mammoth in scope, visually gorgeous, and narratively satisfying as the original Blade Runner. Denis Villeneuve brings his calm, steady directorial presence to this film. Nothing is rushed. He takes his time with every scene. The film may be long because of this, but none of it feels forced or rushed either. Roger Deakins' cinematography is ethereal. He seriously deserves an Oscar for his work on Blade Runner 2049. This film is a visual feast in every sense. It was the perfect theater experience. In every way, this was exactly what I had hoped it would be -- a gorgeously created sequel to one of the best science-fiction films ever made. It's for that reason (among others), that it is my favorite film of the year.